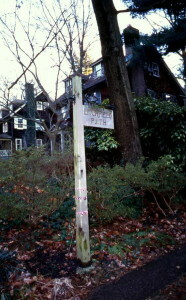 A sign for Litchfield Path, one of the many walking paths in Roland Park. On this popular seasonal adventure, discover and explore the unique footpaths of the Roland Park community while learning about the history and architecture of the neighborhood. In developing this community in the late 1800s, the Roland Park Company incorporated into its plan a series of footpaths, 18 in all, designed to expedite foot traffic between various sections of the neighborhood, especially in those where the terrain made it difficult to build roads. 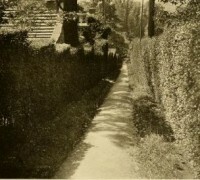 Designed by Frederick Law Olmsted, Jr., son of the famous landscape architect Frederick Law Olmsted, Sr., in collaboration with Edward H. Bouton, general manager of the Roland Park Company, the paths were part of a hierarchical system of roads in front of houses, service lanes in the rear, and footpaths that provided convenient ways to cross through the neighborhood in a natural setting. Each path is named with a distinctly country ring: Squirrel, Hilltop, Laurel, Tulip; others are decidedly British: Audley End, Tintern, St. Margaret’s, Litchfield. Come learn about the Olmsted/Bouton legacy while exploring some of these paths. NOTE: Meet at Roland Park Branch of the Enoch Pratt Free Library, 5108 Roland Avenue. Walking on rough terrains and hill is involved. Please wear comfortable walking shoes and dress appropriately for the weather. Tour Guides: Judy Dobbs has lived in Roland Park since 1981. 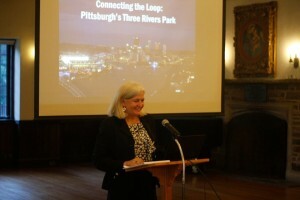 As a member of the board of the Friends of Maryland’s Olmsted Parks & Landscapes, she is committed to promoting the rich heritage of Roland Park and other Olmsted-designed communities in Maryland. 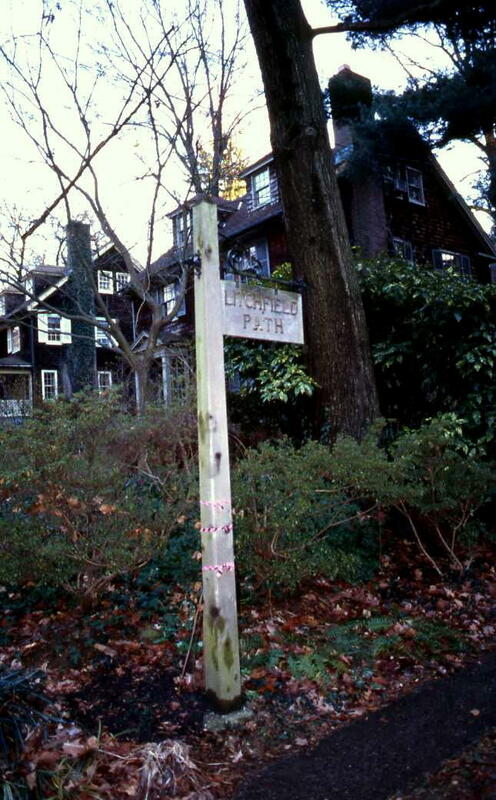 For most of her life Kathy Hudson has lived on a Roland Park footpath. She has written about the community, its residents and architecture for more than 25 years in The Baltimore Messenger, The Sun and Baltimore Style magazine. Her recently-released book is On Walnut Hill: The Evolution of a Garden. Join us for a Motor Coach Day Trip to Washington, D.C.
Not a reply to join a walking tour, but the streets and walking paths allow one to get away from the madding crowd for a few hours and get some great exercise on hilly climbs both on pavements and paths. The colored walking path map sent by a local contact is invaluable and will be coveted for years to come. Please refrain from sending messages now that you have my e-mail address, thanks.